Retired baby boomers traveling in a 26' Wind River travel trailer at the time but have camped all our lives from pup tent to big tent to horse trailer to tent trailer to camper to trailer to fifth wheel and now back to trailer. We love being on the road, our favorite "schedule" a few days at an RV park and 4 or 5 days dry camping. 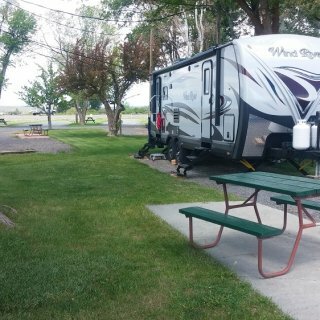 We use rvparkreviews extensively and hope to be contributors as we travel more and more during our retirement years. 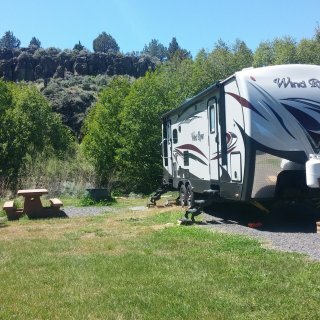 Nicest BLM campground we've ever seen. Newer ADA bathrooms. Many sites spaced quite far apart. 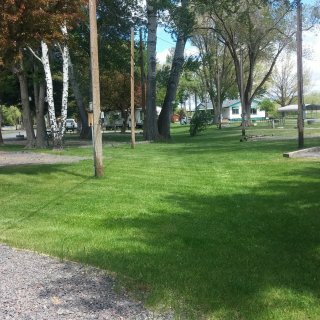 Grass growing vigorously in May, mowed by park staff. 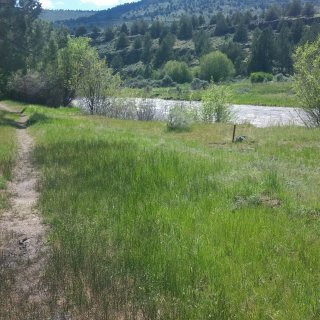 Lovely trail taking off from the end of the campground along the Blitzen River. Tried to make the loop on the Wilderness Nature trail but never found a place where it would loop around back to the campground. Beautiful hike anyway. The springs are very pretty, and the river provides serenity and habitat for lots of birds. We saw a pair of cinnamon teal in the waterway from the springs to the river. 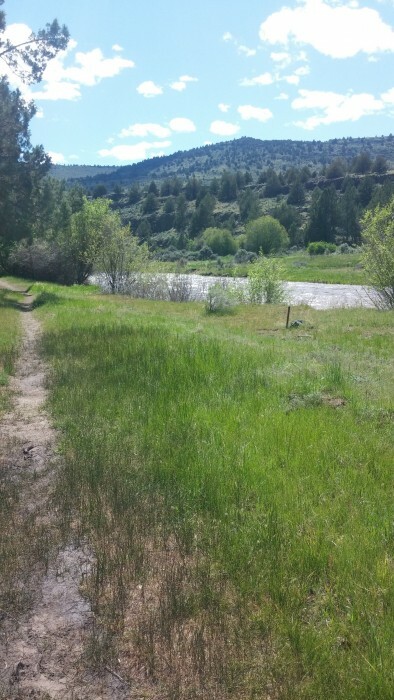 This waterway flows through the campground. No mosquitoes during our visit, but while eating at the Frenchglen Hotel (excellent food BTW) we overheard a BLM field worker saying they would be out soon "in force." The loop road to Steens (closed this early) starts within walking distance of the park. 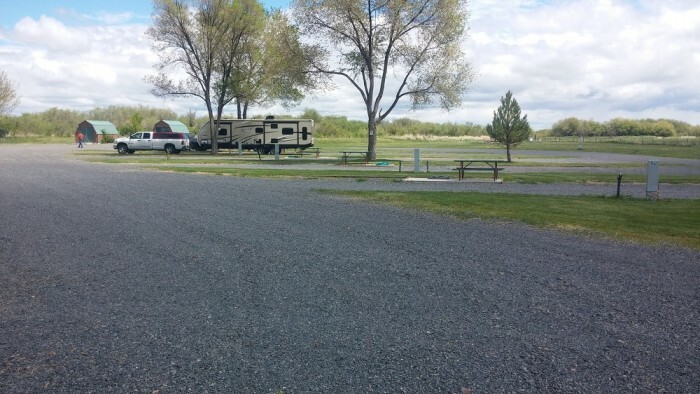 The park is at the south end of the Malheur Wildlife Refuge, a great place to stay while exploring there. 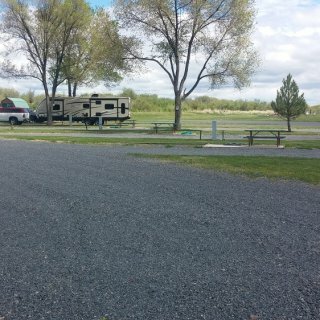 We camped at Page Springs Campground - BLM in a Travel Trailer. Malheur Wildlife Refuge, Frenchglen Hotel (restaurant food is excellent), small grocery/sundries store next to the hotel, Steens Mountain scenic loop road, several ranches in the area, including the Round Barn. The historical museum in Burns is an excellent place to start a trip to this area - going here first will give you a good idea of the history of the area and the families who came there first to settle. We have stayed here several times and will always choose this park when in the area. Extremely clean, sites very well spaced out, extremely friendly and accommodating staff, lovely field behind the park. Highway 20 borders one side of the park, so if you want quiet ask for a site as far to the rear as possible. 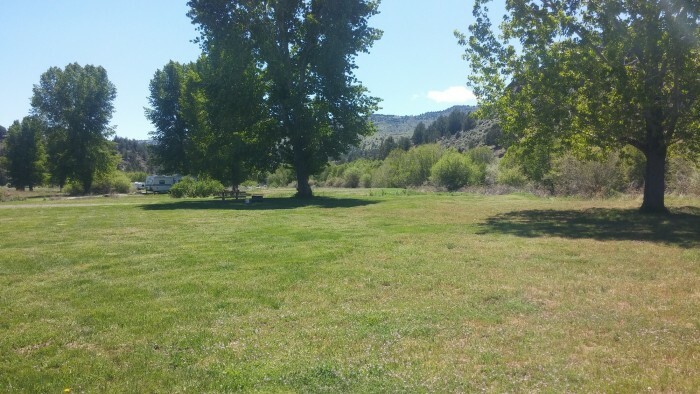 Picnic tables at each site, large manicured grassy areas, big trees for shade, perfect for overnight or an extended stay if you want full hookups. No fire pits. Laundry has two washers and two dryers, very clean. Women's restroom has two toilet stalls (one quite large) and two showers, both roomy with excellent water flow and cute new shower curtains - all extremely clean, closed from 11 to 1 for cleaning. 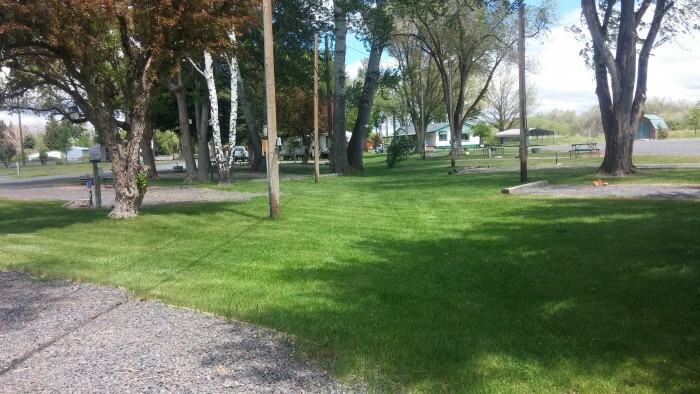 We camped at Burns RV Park in a Travel Trailer. Don't miss the Malheur Wildlife Refuge, especially if you're a birdwatcher. 30 miles from Burns. The draw for this park is the hot springs pond and private tubs. The pond is full of wonderful hot water that feels so silky and smooth, makes you feel great. Birds all over the place. There are 5 electric/water RV sites and I believe 2 with sewer as well. We paid $26 because there is a $3 pet charge, but normal rate is $23. #5 has the best privacy, if it can be called that, for sitting outside under your awning; otherwise in #1 thru #4 you are really right on top of your neighbor. Enough room for slide-outs and awning but just barely. No grass or trees in or near the sites, just gravel. There are also 5 cabin-type accommodations around the pond (quick walk, a few steps to the water) and 5 apartment-type accommodations further away from the pond. 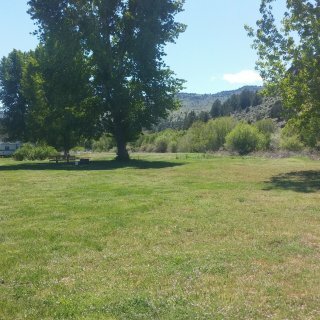 There is a dry camping area that we didn't really take a good look at, but it appears to have a lot of grass, probably nice for tent campers. There is a communal kitchen, a couple of communal fire pits (none in the RV section), and a very nice common room with big screen TV, tables and chairs, Wi-Fi (which isn't available in the RV sites, only in this room), lots of books and games, and some nice soft stuffed chairs. Make a reservation if you plan to go and might want to stay more than a night. You can also pay a day-use fee that is very reasonable to use the pond. The surface in and around the pond is a black volcanic gravel that is fairly sharp - I saw people using it barefoot, but I had to use water shoes, hubs had to use flip-flops. The restroom at the pond area was very clean, but the showers (only 2) were minimal at best, and I couldn't honestly call them clean (gravel on the floor, soiled bath rug on the floor, and icky shower curtain). We would stay here again if in the area but ONLY for the pond, which was really wonderful. It's open all night, and you can wear whatever you want except your birthday suit. Highway 78 is within hearing distance, but it is by no means noisy anywhere in the park. 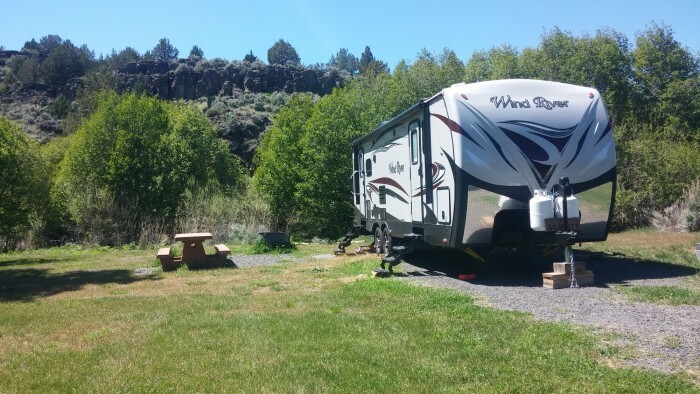 We camped at Crystal Crane Hot Springs in a Travel Trailer. Don't miss visiting the Malheur Wildlife Refuge, especially if you are a bird-watcher. Burns is within 25 miles for restaurants, grocery, hardware, etc. I wouldn't go in hot weather - very little shade, and it gets really hot in this part of Oregon during the summer. I'd suggest spring or fall. Who wants to get into a pool with hot water when it's already hot outside anyway? Basic no-frills level gravel spaces to park, no shade but little trees have been planted. Best thing about this park is the cafe next to Stan's Mercantile - excellent food! We were on our way from Hanksville to Kodachrome Basin State Park and didn't want to drive that distance all in one day so stopped here unannounced. Besides the horse in the pasture next year attracting flies, our overnight stay was perfectly acceptable. 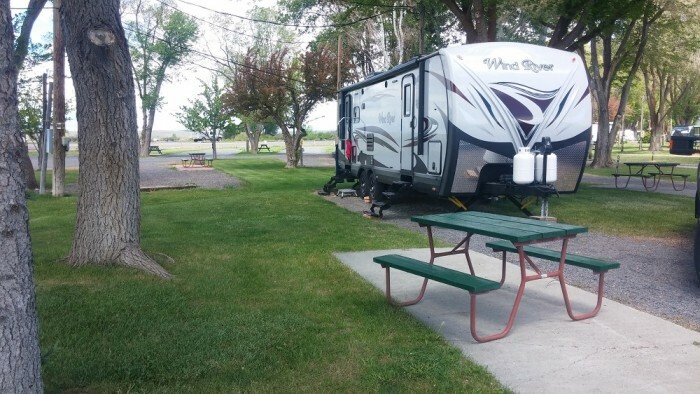 We camped at Piute Trail RV Park (formerly Stan's Merc and RV) in a Travel Trailer. Eat at the cafe next to Stan's Mercantile, excellent food. We had breakfast there and also got some ice cream and cheesecake to go - yum!